West of England & South Wales Women's History Network – Set up in 1993 by a group of women academics who wanted to encourage research and stimulate interest in women's history and gender history in the south west of Britain. Welcome to The West of England and South Wales Women’s History Network. The Network was set up to encourage research and interest in women’s and gender history both among academics and the wider community. We hold events, including an annual conference, workshops, film showings and visits to archives throughout the year in different venues around the region. Please note that the location of this conference will no longer be Abergavenny. It has been changed to the University of the West of England, Bristol. 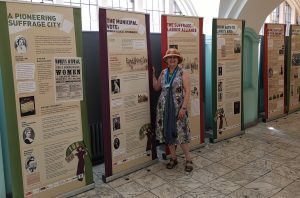 Pic: Dawn Dyer of Bristol Libraries with the Votes for Women 100 banners.